The Master of Water Security (MWS) is a cross-disciplinary, project-based and professional-style program that may be completed in 12 months of full time study. Students are trained in science, engineering and policy analysis to investigate water security issues of regional, national and international significance through a holistic lens. Graduates are ready to become water scientists, managers and policy-makers with the necessary expertise to tackle the complex and multidisciplinary water problems facing us now, and in the future. The program is a joint initiative between the School of Environment and Sustainability and the Global Institute for Water Security - a world-leading centre focused on research that addresses issues such as climate change and water resources, flooding and drought, and the social and policy environment surrounding water management. The U of S has one of the highest concentrations of faculty working in water research worldwide and is the destination point for those seeking integrated, comprehensive training in water security. Join us and study with one of the strongest water research communities in North America. The Master of Water Security is a uSask degree that is offered at the University of Saskatchewan in Saskatoon, Canada and at Beijing Normal University (BNU) in Beijing, China.When applying, indicate in your statement of intent that you would like to study at BNU if you would like to study in China. 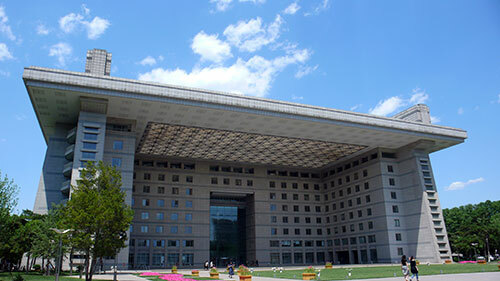 Beijing Normal University (BNU) is a key university directly under the Ministry of Education. The predecessor of the school was founded in 1902. After more than 100 years of development, the school now has 23 colleges, 10 research institutes, three faculties, and two departments. Due to its comprehensive strength, BNU ranks among the top universities in the country. In the 2017/18 World University Rankings published by the UK Higher Education Survey (QS), BNU ranked 256th and ranked 8th among Chinese universities. The BNU College of Water Sciences was formally established in 2005. Presently, there are four departments: Department of Hydrology and Water Resources, Department of Groundwater Science and Engineering, Department of Water Ecology and Environment, and Department of Water Security. BNU also has one Key Lab of Ministry of Education (MOE) and one Key Laboratory of Beijing. It is not necessary to find a potential supervisor before you begin an application. The list below may help you to learn about the research interests of our faculty. My research interests focus on past and future climates in Canada, especially on how they relate to dynamic ecosystem and geomorpholgical processes. My specialization is dendrochronology (tree-ring analysis) and I use dendrochronological techniques to gain an understanding about past climates, past glacier activity and extent, past ecosystem dynamics, and even past human activities through dendroarchaeological and dendrochemical investigations. Social dimensions of environment and sustainability, environmental governance; community-based ecosystem management; gender-based analysis; and climate change adaptation. Sustainability of rural communities including inland delta communities, biosphere reserves, model forests, and forestry communities more generally. Mathematical, statistical and computational modeling of complex biological and biophysical systems ?EUR" systems biology and functional genomics; biological sequence analysis; comparative genomics of bacteria; structure-function relations in plant roots; genotype-phenotype relations in crop plants; dynamics of large-scale outbreaks of infectious diseases. For tuition for students taking this program at BNU, please see the BNU Brochure. Specific areas of interest that could lead to a project topic. A description of why the applicant wants to pursue professionally-oriented graduate study in the interdisciplinary context of the School of Environment and Sustainability. A description of any employment or study experiences that relate to the professional interests described.